USC quarterback Matt Barkley soared to many heights in four years, but a late-season injury in 2012 cost him the Notre Dame and Georgia Tech games with what he confirmed this week at the combine was a separated shoulder. 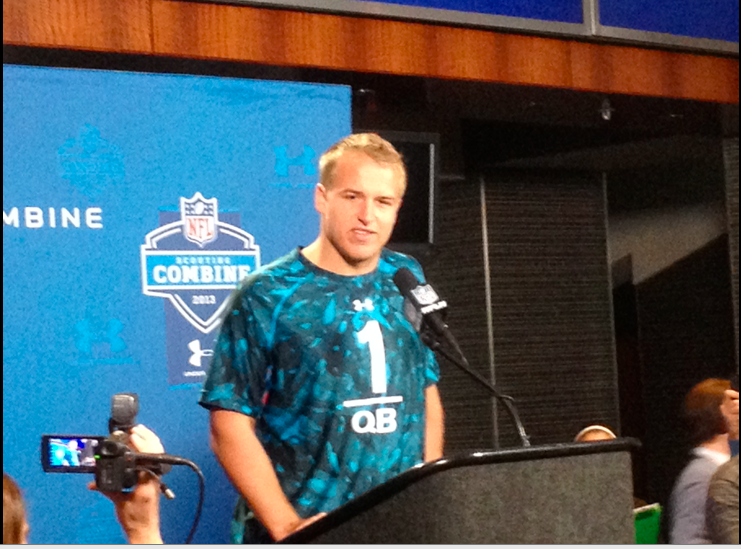 Barkley, 6-2, 230, is one of 19 quarterbacks attending the combine. He is the latest of a long line of Trojan quarterbacks trying to make a mark in the NFL. Barkley leads the list of combine QBs and believes he is the best performer in a draft class that includes Geno Smith and Mike Glennon, among others. “I believe I am. I don’t think you can go into the draft not thinking you are,” said Barkley on Friday. Barkley returned for a senior season after drawing some NFL attention a year ago. That draft class included Andrew Luck, Robert Griffin III and Russell Wilson, and Barkley said he did not regret his decision. “(I) wouldn’t change my USC career for anything,” he said. In 47 games, Barkley earned a 34-13 starting record. In passing for more than 12,000 yards and 116 touchdowns, he set 20 school record career, season and game records, 10 of which established Pac-12 records. Barkley was queried on past successes and non-successes of USC quarterbacks in the NFL. He cautioned that his story is his own and comparisons aren’t necessarily a fair thing to make. That said, he admitted there is work to do. Seattle coach Pete Carroll has a USC lineage. He also had the talents of Wilson in 2012. Carroll feels Barkley is set for the next step. This year’s QB crop does not have the sizzle of last year’s bunch when Luck and Griffin III went 1-2, while Ryan Tannehill (8th) and Brandon Weeden (22nd) went in the opening round. This past season Andrew Luck was routinely asked about his matchups with some of his fellow rookie signal callers. First, it was the preseason contest against the Redskins and Robert Griffin III. Regular season matchups followed against the Browns and Brandon Weeden and lastly with the Dolphins and Ryan Tannehill. Luck always downplayed facing the quarterbacks that share the same draft class and he will have to do that once more in 2013 when Seattle and Russell Wilson travel to Indianapolis next season. Wilson was the final quarterback selected of the five mentioned above yet he delivered with a postseason run that was a mere seconds from a berth in the NFL Championship. Seattle general manager John Schneider cracked a rye smile on Thursday morning when asked if he envisioned the season Wilson provided the Seahawks in his rookie campaign. “We liked (Wilson) a lot, but for me to tell you that he was going to do what he did in his first year I would be lying to you,” Schneider said. Schneider said that the ‘poised, intelligent and accurate’ Wilson that the NFL saw this season carried the same attributes coming out of college, but foreseeing a season like this was hard to imagine. This past year, Wilson threw for 3,118 yards and tossed 26 touchdowns, compared to just 10 interceptions. His ability to escape pressure kept numerous plays alive for the Seahawks offense and he rushed for 489 yards in 2013. Trying to protect dual-threat quarterbacks was a hot topic at the combine on Thursday and Schneider offered his opinion on Wilson. “I think Russell is also a guy that can stay in the pocket, deliver the ball and deliver it on time and is a guy that has a unique way of finding passing lanes and throw it with timing,” Schneider said. For Wilson, the next move in the offseason is taking some time away from the gridiron. Since playing in the 2012 Rose Bowl, Wilson has been in non-stop football mode according to Schneider. With three rookie quarterbacks experiencing the playoffs in their first years in the NFL, there seems to be a race brewing to who will get to the Super Bowl first. Seattle and Wilson were the closest last season and now is striving for the next step.